You've invited your guests, developed a menu, agonized over activities, and soon guests will arrive at your home ready to be entertained. Despite all other preparations, none is more important than assuring your guests of a comfortable, clean, place to be entertained in. Taking the time to make your home ready for guests can be intimidating for even the most seasoned housekeeper. Evaluate what needs to be done. Writing down a quick list of rooms and places in your home that need attention will give you a plan. Don't forget entry areas and coat closets. Start with the most important rooms. Sometimes it helps to begin cleaning from the entryway to your home and work your way through the places your guests are most likely to go. Check out the intense cleaning guides for living areas, bathrooms, and bedrooms. Don't forget the clutter. Clutter can give a spotless home a messy appearance. Give your guests room to move freely in your home. If you're having trouble getting rid of items ask yourself these questions about clutter. Try to get yourself jump-started by choosing a small junk drawer. Don't forget to use the 4 container clutter method to organize any job. Take shortcuts that work for you. If there won't be any children at the party and your guests will only be in living areas, don't worry about cleaning and detailing family bedrooms. If the party is informal, make your serving dishes informal too. Find ways to save time that fit with the party you're trying to have. Prepare for minor cleaning emergencies during the party. Be aware that stains are probably the number one party cleanup culprit. Stock up on your favorite stain removal products. Double check the stain removal help list. Most of all, don't stress. 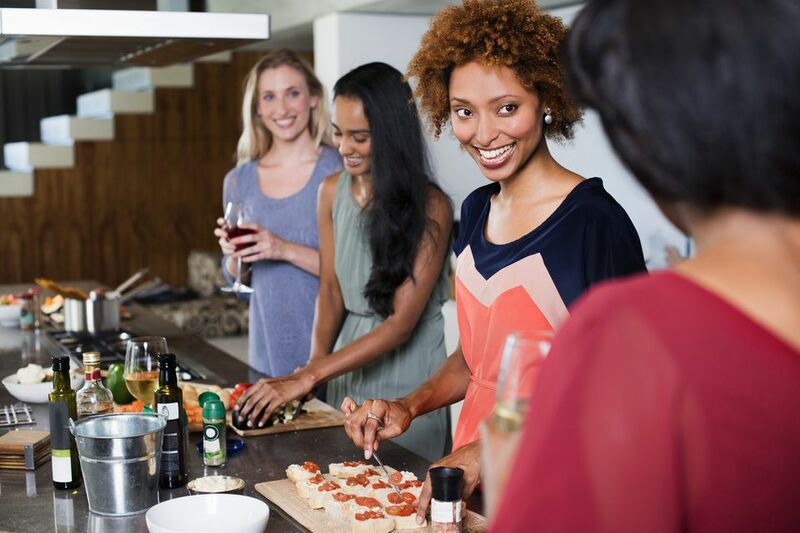 These things happen and being prepared only shows more of your ability as a host or hostess. Recruit help. Use your family or closest friends to help you prepare. Find tips on involving your family in cleaning and use them to mobilize your forces at home. For many people, professional cleaning help may be the better choice. If you intend to have help before or during the party, be sure to reserve your place as soon as you have the dates and times you'll need them. Especially during any holiday season, help can be hard to find. Add your own finishing touches. Preparing your home for a party is more than just stripping it of its clutter and dirt. It also gives you a chance to add small touches that make your home comfortable and inviting. Try flower arrangements, photographs, candles, or incense. Try to stimulate the senses of your guests. Do a walk-through after you've cleaned and decluttered to see how your guests will experience the rooms in your home. Enjoy the party. Try not to stress over the little things that may seem to go wrong during the party. Just enjoy the fruits of your efforts. The more involved and complicated the party is, the more time you'll have to prepare your home. Last minute informal gatherings do not require your home to be in perfect order. The 15-minute cleanups should be adequate to get your house in shape.